How do you save money while visiting Washington, DC? Vacationing in the nation’s capital can be expensive, but it doesn’t have to be. If you do your research and make a plan before you go, you can find a bonanza of things to see and do that fit within your budget. There are a lot of places—museums included—that don’t charge a fee to visit. For example, on the National Mall alone, you can visit 10 museums, including the National Museum of American History, National Gallery of Art, National Air & Space Museum, and National Museum of African American History, without paying an entry fee. One of the most beautiful stops, in my opinion, is the U.S. Botanic Garden, which has an amazing conservatory filled with tropical and subtropical plants (it does get a little warm in the summertime), as well as an outdoor rose garden, butterfly garden and First Ladies Water Garden. One added advantage to visiting some of these spaces is that many of them also offer free, docent-led tours, so that you not only get to see amazing things at the National Gallery of Art, for example, but gain a better understanding of the artists themselves. Why spend all of your time in traffic or trying to find parking, when you can travel all over the city on the Metro? The easiest way to do this is by getting a SmarTrip card, which can be used for both the Metrorail and local bus systems. If you have the card, you actually save money because bus transfers are free, and bus-to-rail transfers are discounted. There are special discounts for seniors, those with disabilities and students as well. 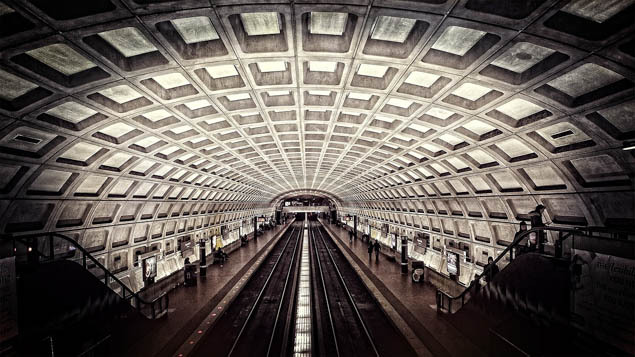 Depending on where you’re staying, you might even get up to a $15 per night discount on your hotel room—check the WMATA (Washington Metropolitan Area Transit Authority) site to find those kinds of offers. Speaking of, the WMATA site also offers a really great trip planner page so that you can map out your routes, as well as a first-time Metro user page to help those who have never used the service feel more comfortable. An important note: if you’re going to order your card online, do it AT LEAST five days in advance to make sure that it arrives in time for your trip. You can also easily purchase the card at any metro station. The closer you are to downtown D.C., the higher the price, so save money by renting a room further away. The Metro system is easy to use and goes just about everywhere; a number of hotels also offer free shuttles into the downtown corridor or to nearby metro stops, especially when there are big events happening. Before you make a reservation, talk to the hotel to see what kind of transportation options they provide—I was pleasantly surprised by how easy it was to get to a rally in the National Mall when I stayed outside the city; because so many of their guests were headed downtown, the hotel scheduled special shuttles to get us there. As always, booking ahead of time online can save you money because you can take advantage of ticket price reductions or even Groupon-type offers. You can also schedule your visit for times when there are even more free things to do; for example, Walkingtown DC, which takes place in September, offers more than 50 free, guided tours throughout the district, ranging from after-work happy hour tours to long weekend walks. During the summer months, you can enjoy free concerts almost every Friday night at the U.S. Capitol, where different branches of the military have performed these concerts for more than 130 years. The more flexible your schedule, the more chance that you can enjoy free stuff, making the most of your time while spending the least amount of money. Do you have any insider tips on how to save money in DC? Tell us about it on Facebook!